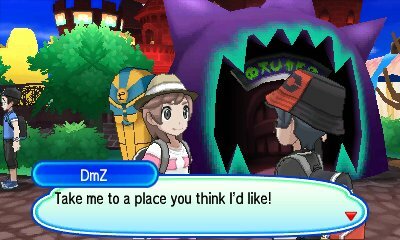 The Festival Plaza is a returning feature in Ultra Sun & Ultra Moon and hasn't changed all that much, but it has brought a whole new facility. 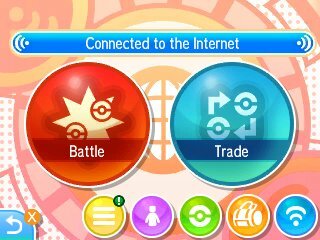 It is accessed by pressing the special Festival Plaza icon on the bottom screen at any time, warping you there. As you do more things in the Festival Plaza, then more facilities and more things to do in those facilities will become available as you level up. This makes it very akin to the Join Avenue in Black 2 & White 2. 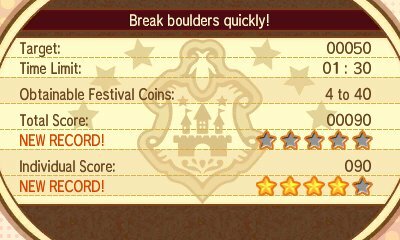 To level up, you need to earn Festival Coins by doing a variety of activities. The unique feature about the Festival Plaza is that it will propogate itself with players you will find online and locally, and from there you can interact with their avatars and help earn Festival Coins to spend on the various activities in the Plaza. This is not limited to people on your friend list, but rather all players that are also playing online, and when they see you they can even challenge you to battles or request trades. 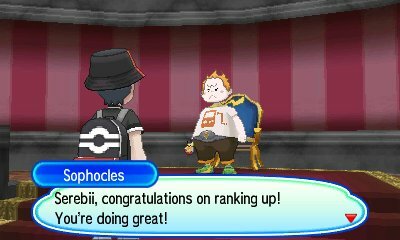 As you rank up, when you speak to Sophocles in the Festival Castle, you will be offered a brand new facility to adorne your Plaza if you do so wish, and will give you an item if you don't such as Pearl, Big Pearl, Nugget and Festival Ticket. However, there are several levels where you get a special bonus as well. Level 10 You can now order the clothing of other players if you don't own it. Level 20 You can now change the name of the Festival Plaza. Level 100 The "I reached Festival Plaza Rank 100!" greetings becomes available. When you hit Level 40 in the Festival Plaza and have beaten the league, you'll gain the ability to change the music that plays while you're playing in the Festival Plaza. This is done by speaking to the construction worker in the building of Festival Plaza. 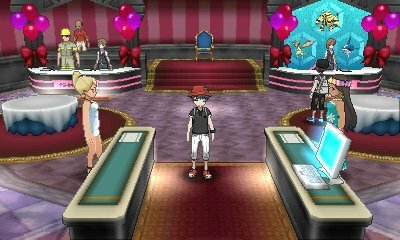 Also, after you have beaten the Elite Four and become Level 30, you can unlock even more new items for your stores. Top Left - This helper will allow for you to page a Guest or VIP into the castle. 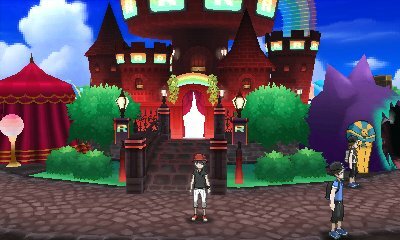 New to Ultra Sun & Ultra Moon within the castle is now the desk to play the Battle Agency. As you play with Festival Plaza, various random people online, as well as ones on your Friend List, will appear. These characters can be interacted with where they will request for you to suggest certain shops to them. This will be notable when their speech-bubble as you walk past them is red. They will either ask you a question about yourself, ask your opinion on one of their stats or ask you to take them to a place in the plaza. If you succeed at doing so, then you will receive Festival Coins with more coins the more successful you are. You will also have the ability to make them VIPs. If they are VIPs, then they are more likely to appear in your plaza in the future. If they have clothing that you don't own, such as in a colour that is not available in your game, you also will eventually have the ability to order the clothing directly from them. Players are ranked based on the players that are in your plaza so you can hunt down corresponding players. When in the plaza, you will often be able to take on missions. These missions range from answering quizzes to actually capturing Pokémon. You will receive Festival Coins based on how well you do. In the Pokémon Global Link, there will also be special Global Missions where all players will work together to reach a specific goal for the mission. There are many shops in the Festival Plaza, and they each have specialties. There are 35 different facilities, many of which share functionality, just with different results. To get more facilities, interact and help player avatars as they appear and once you reach Level 10, you'll be able to get stores from other players. This will allow for you to get the stores that may be native to the version other than yours. You can use each store once per day. There are a variety of shops that you can purchase sets of items from the shops. These shops have version exclusive rank variants which allow for more items to be purchased once per day. 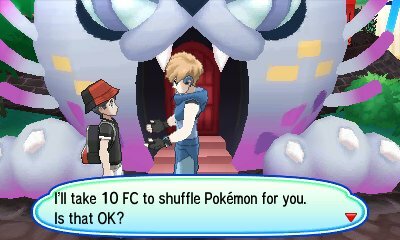 The haunted houses are essentially small adventures that you send your Pokémon on in order to receive items for the price of 10 Festival Coins. The item you get is random, but the higher the rank of the house, the more likely you'll get the higher prizes in the table. Shades of your journey await! You’re 10,000 Bright-years from facing Brock! Hey! Wait! Don’t go out! I bought an adorable doll with your money. I’m going to train 24 hours a day! For 10 years I chased Suicune. I am just so deeply moved! We have finally made it! You’ve taken your first step! I’m just the strongest there is right now. You guys need some imagination. You made a much bigger splash! You ended up giving me a thrill! I’m not buying any Dolls. Take your time and rest up! Have a blast, Pokémon Trainers! I got ashes in my eyelashes! Number of collisions: 5 times! Your will is overwhelming me! This is it! My trump card! It’s a $10 million fine if you’re late! You’ll never be able to stem the flow of time! Your team! I sense your strong aura! What do you think you’re doing?! The ring is my rolling sea. ? I was just thinking out loud. My code name, it is Looker. It’s not possible that I lose! You’re about to feel my rage! Nimbasa’s Pokémon can dance a nimble bossa! People call me Mr. Medal! 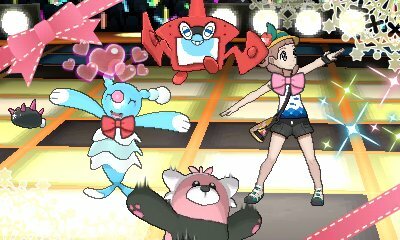 Trainer, do your best, too! I won’t allow anyone to stop me! I was expecting exactly that kind of move! I want to know what a “Trainer” is. When I lose, I go out in style! Let’s give it all we’ve got! Try as hard as possible! But this is adieu to you all. You’re just too much, you know? Fool! You silly, unseeing child!